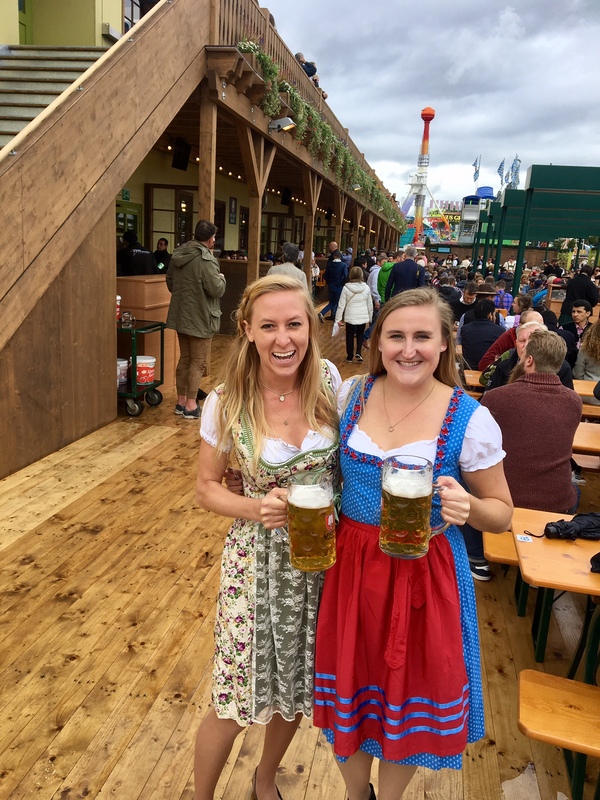 In the self-proclaimed city of laptops and lederhosen, here’s everything I learned about surviving opening weekend at the infamous Oktoberfest festivities in Munich, Germany. 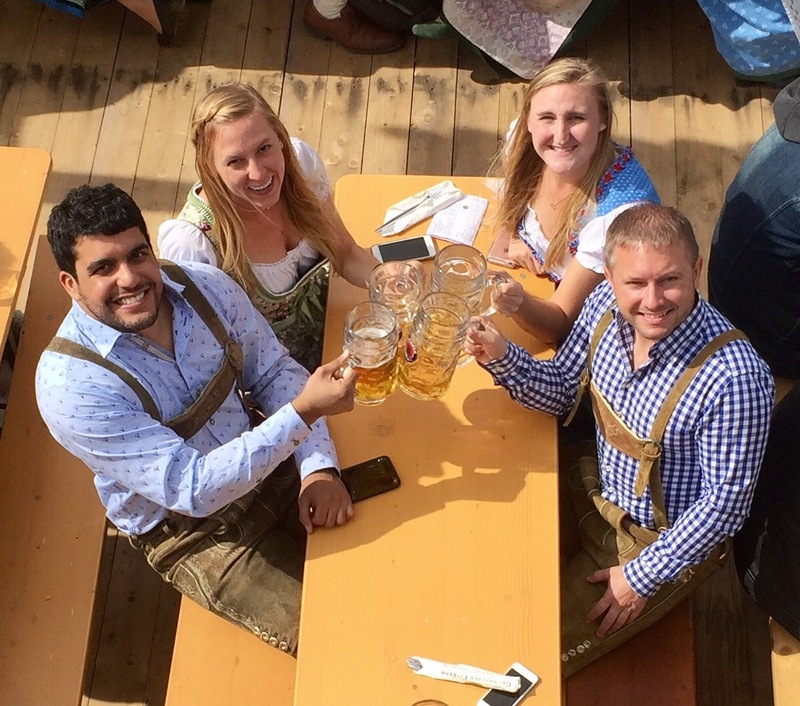 Oktoberfest was found in 1810 as a wedding celebration for Prince Ludwig and Princess Therese. The fair grounds are named Theresienwiese after her and it originally took place in the middle of October. However, Germans realized that October can be effing cold and pushed the festivities up into September for the warmer weather. It now lasts about 3 weeks and ends on October 3, which is Reunification Day when East and West Germany became one country again after the Cold War. 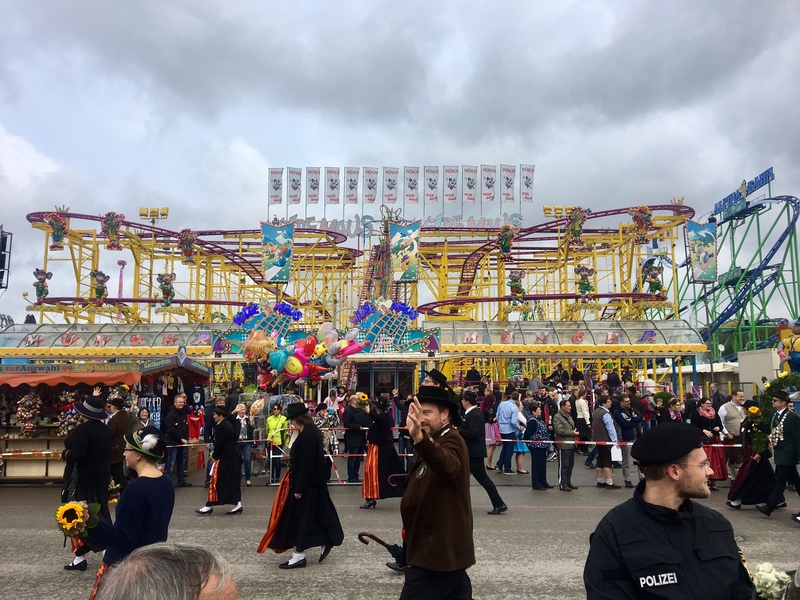 Oktoberfest is the Houston Rodeo (with more beer). It’s a giant fair with carnival games, amusement park rides, parades and fair food. However, instead of bull-riding and concerts in the evenings as the main event, you just drink a lot of beer. Entrance to the fair grounds are free. You should 100% dress the part. Basically every store in Munich is selling dirndls (women dress) and lederhosen (leather pants for men). According to my German friends, super fancy traditional dresses and pants are custom made and can go up to 3000 EUR. Obvi, there’s some cheaper options out there. My friend snagged a dirndl on sale for 50 EUR. My other friend got a lederhosen with 2 shirts, 2 pairs of socks and traditional shoes for about 400 EUR. You can cut down on costs by bringing your own shirt, socks, and shoes. 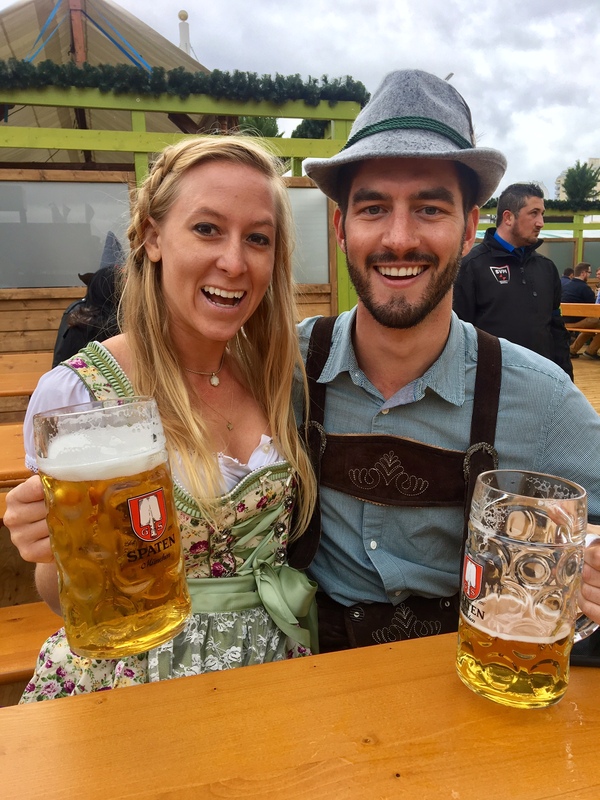 Shout out to fellow blogger Miles with Molly for letting me borrow her dirndl for the weekend! Plan to do other things in Munich. Oktoberfest is a lot. Especially when you’re drinking liters of beer on the reg. We went for two days of Oktoberfest and that was enough. Recover from Oktoberfest with some touristy things around the Munich area. 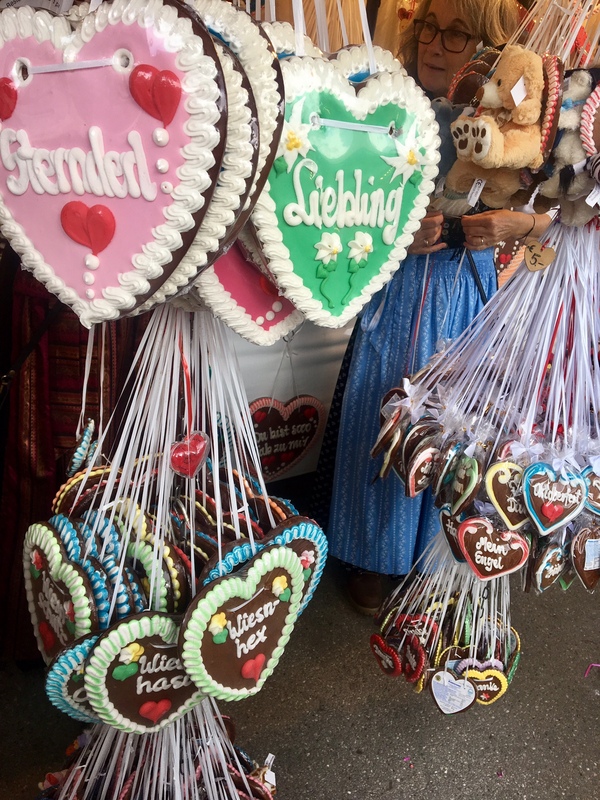 Here’s my 24 Hours in Munich guide for some ideas on how to structure you day! Snag a free table outside. Honestly though, it was pretty easy to find tables outside and get beer. When I went it was raining the whole time, but we managed to find tables under roof coverings and giant heaters. I’m a Houstonian pansy for the cold and was quite comfortable despite the lousy weather. Bring cash! That’s the only way to pay for beer. A liter of beer (aka the only size at Oktoberfest which is 2.8 American beers) is about 10-11 EUR each and you pay as you go. Allegedly, if you tip your server well for the first round they’ll be quicker to deliver the rest. However, I didn’t necessarily find that to be true and think the tipping rumor is an urban legend to scam Americans. I didn’t tip on any of my beers and they came out just fine. Tipping isn’t a thing in Europe, and the servers don’t expect it or really even give you time to leave a tip. Remember to eat. No for real. Take your time and EAT. 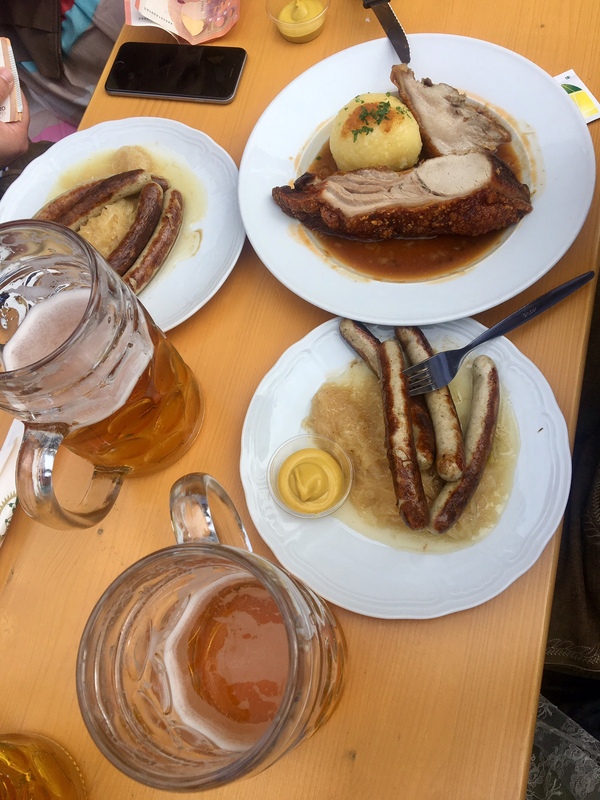 Those liters of beers aren’t messing around and you’re set to blackout real fast if you don’t put some delish Bavarian food in your stomach. You can get all sorts of fair food outside–pretzels, fries, etc. and legit dinner plates at your table with Bavarian classics like sausage, sauerkraut, half chicken (a favorite amongst my friends), and my personal favorite spaetzl–cheesy pasta! If you’re vegetarian or vegan–great news!–pretty much every stand has a vegetarian section designated. Europe is fantastic. Don’t eat the gingerbread cookies. They’re technically edible and sold everywhere, but taste really horrid. Visit all the tents! I found they all have different vibes. Granted, they all get a little rowdy as the night goes on, but some more than others. 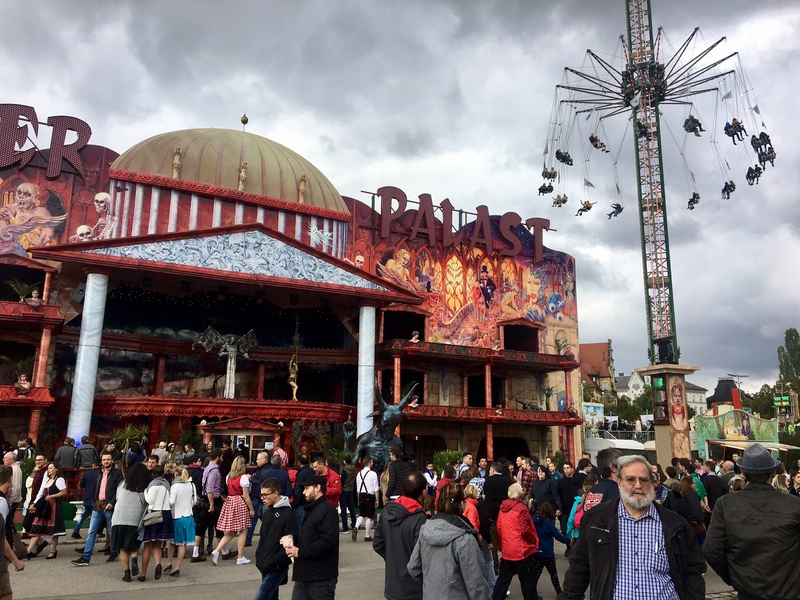 I made visits to the Paulaner Festzelts, Spatenhaus, and Martshall tents. My favorite was getting rowdy inside the Haufbrau tent! There’s live bands in every tent and as the night goes on they switch from playing traditional Bavarian music to rowdy crowd pleasing sing-a-longs. Pace yourself. Every 15 minutes or so (at least in the Haufbrau tent) they play a traditional drinking song called “Ein Prosit” that encourages everyone to drink “one bubble” of their beer glass, so by the end of the hour you’ve drank the whole beer. AGRESSIVE. PS You should learn the lyrics of Ein Prosit. Don’t chug the beer. Unless you want to get kicked out. If you stand on the bench, chug your beer, everyone will stand up and cheer and go crazy, you should flip the glass over your head to prove its really empty and then security will graciously kick you out. You can’t stand on the tables. The benches are fair game, but security will slide on over to you real quick if you end up on the table top. Careful though, benches and tables get real sticky and slippery real quick. Don’t bring anything you don’t want to lose. It’s just like college. Even if you stash your coat in a secret corner at the bar, at the end of the night when everyone is hammered all black and navy blue jackets look the same and are fair game for someone to walk off with. Try to keep all important things on your person and don’t dear god bring your passport to Oktoberfest. 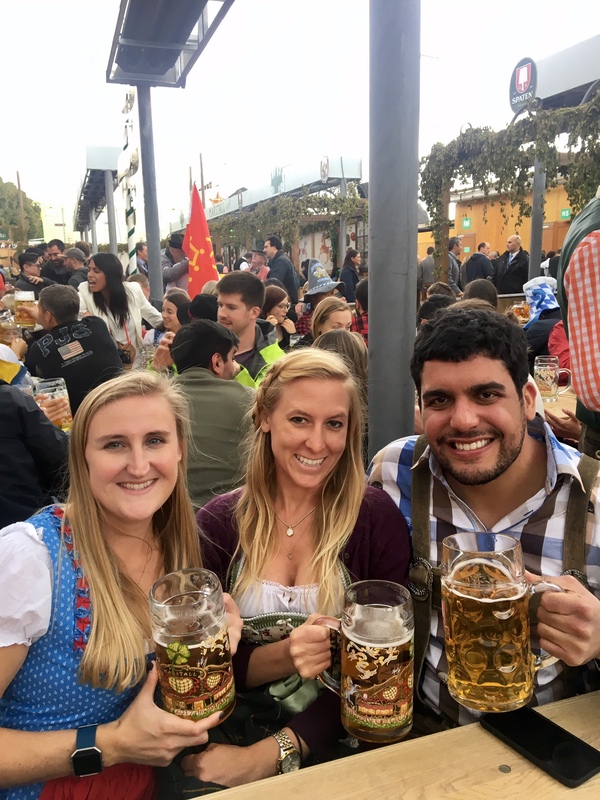 Omg just writing this post is making me so nostalgic and all I want to do is go back to Oktoberfest. It was so much fun. I love Germany and am already plotting my return again. 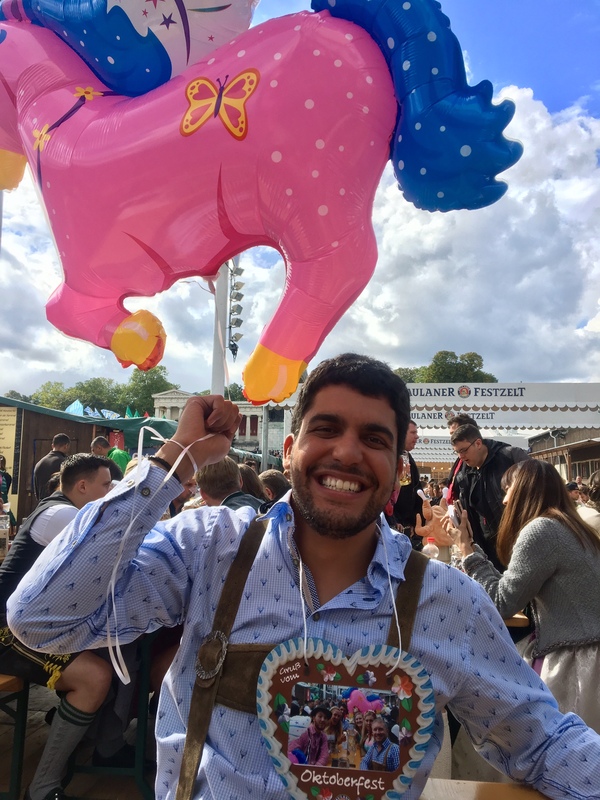 Here is the recap for the rest of my German adventures from my week in Munich. 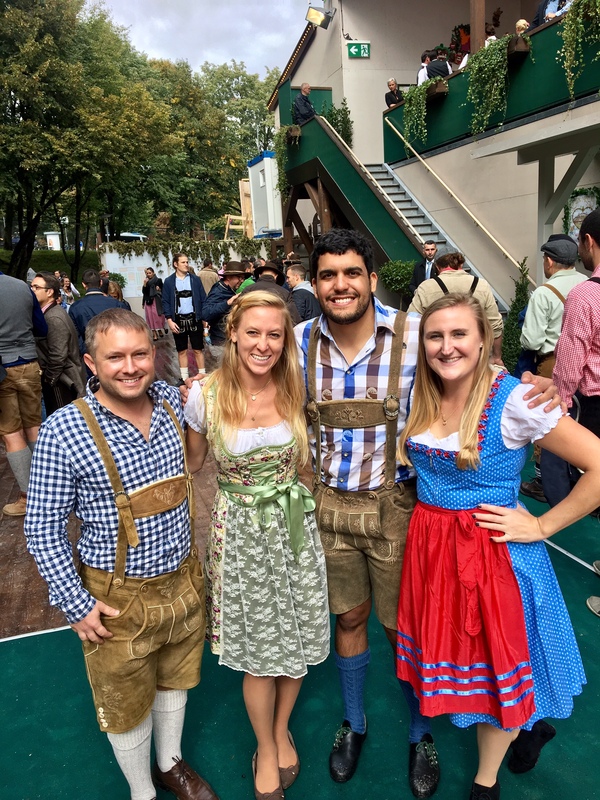 Any Oktoberfest tips you want to share? Tags: beer, dirndl, Ein Prosit, Germany, lederhosen, Munich, oktoberfest. Bookmark the permalink.